To the dismay of fans the world over, Taylor Swift decided to remove all of the songs and albums from the music streaming service Spotify this week. But what does this say about the future of the service, the way we engage with music and the industry more generally? The numbers leave us in no doubt to the American star’s popularity. 25% of listeners on the service have streamed her songs and her tunes were on 19m playlists. The removal coincided with the release of her new album ‘1989’, which is the fastest selling album in the U.S. since 2002. So was this a business decision to boost sales, or a revolt against an unfair system? 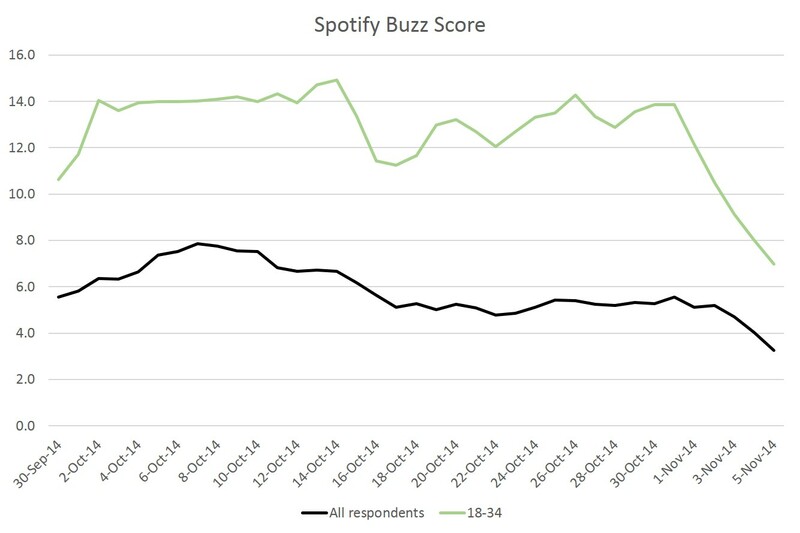 YouGov BrandIndex data indicates to us that the news has impacted negatively on Spotify. It’s Buzz score (whether a respondent has heard anything positive or negative about a brand) has declined in the last few days from +5.6 to +3.2. More striking is the decrease in score among Spotify’s key demographic, 18-34 year olds. Here we see the score decrease from 13.9 to +7.0. As the main target age bracket, Spotify needs to show this group they can attract and retain the most popular acts on the service in order to preserve the company’s popularity. In fact, a recent YouGov Reports publication on the future of radio referenced the fact that 50% of those aged 16-24 view online music videos and 39% use online streaming services, underlying the importance of this demographic. Another challenge Spotify will encounter in the near future is the emergence of an iTunes streaming rival. If Apple were to secure exclusive deals with major world stars which lead to their removal from Spotify, this may damage the reputation and viability of the service irrevocably. There is a risk therefore, that bad press surrounding Spotify will drive customers towards other services. There has been a definite cultural change in the way music listeners consume content and Spotify will obviously remain steadfast in their desire to remain at the forefront of this.